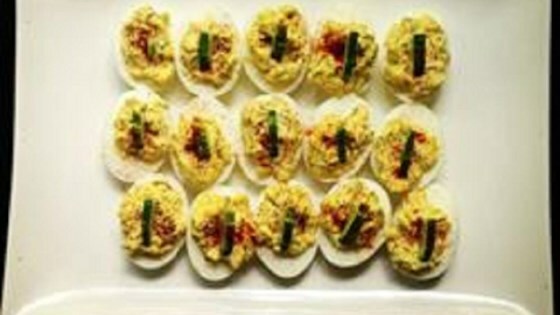 "These deviled eggs are a wonderful appetizer, with lots of fresh dill, plenty of spicy Dijon mustard, plus a surprise layer of prosciutto." Cut each egg in half lengthwise; place egg yolks in a bowl. Mash yolks with a fork; stir in dill, mayonnaise, and Dijon mustard. Place egg whites cut-side-up on a serving platter. Cut each prosciutto slice into 6 pieces; lay one piece into each egg white half. Fill egg whites with yolk mixture; sprinkle with black pepper, top with a cucumber slice, and sprinkle with paprika. Refrigerate, covered, for 30 minutes before serving. Only added 1/4 cup chopped fresh dill. 3/4 seemed too much and they turned out really great. Excellent. Didn't last long when served. That says a lot.